- Publisher This is an updated version for all ages retold in wonderful storytelling fashion. John Bunyan was a simple maker and mender of pots and pans who received very little education. In spite of that, he penned the most successful allegory ever written. Embark on a perilous journey with Christian, the lead character, from the City of Destruction to the luminous safe haven of the Celestial City. The journey will encourage you to "set your hope fully on the grace to be given you" amidst the obstacles of life. - Publisher John Bunyan was a simple maker and mender of pots and kettles who received very little education. In spite of that, he penned the most successful allegory ever written in the striking bluntness of untutored prose. He lost his first wife and was imprisoned for twelve years for his compelling--but unlicensed--preaching. Nevertheless, his preaching about the gravity of sin, salvation by grace, the cost of discipleship, perseverance, and the glory of eternal life lives on in the signs and symbols of The Pilgrim's Progress. Embark on a perilous journey with Christian, the lead character, from the City of Destruction to the luminous safe haven of the Celestial City. The journey will encourage you to "set your hope fully on the grace to be given you" amidst the obstacles of life. This version of the popular story is taken from an excellent abridgment done for children by James Baldwin in the early 20th Century. About "Pilgrim's Progress (Abridged 3cds)"
This is an updated version for all ages retold in wonderful storytelling fashion. John Bunyan was a simple maker and mender of pots and pans who received very little education. In spite of that, he penned the most successful allegory ever written. Embark on a perilous journey with Christian, the lead character, from the City of Destruction to the luminous safe haven of the Celestial City. The journey will encourage you to "set your hope fully on the grace to be given you" amidst the obstacles of life. John Bunyan was a simple maker and mender of pots and kettles who received very little education. In spite of that, he penned the most successful allegory ever written in the striking bluntness of untutored prose. He lost his first wife and was imprisoned for twelve years for his compelling--but unlicensed--preaching. Nevertheless, his preaching about the gravity of sin, salvation by grace, the cost of discipleship, perseverance, and the glory of eternal life lives on in the signs and symbols of The Pilgrim's Progress. Embark on a perilous journey with Christian, the lead character, from the City of Destruction to the luminous safe haven of the Celestial City. The journey will encourage you to "set your hope fully on the grace to be given you" amidst the obstacles of life. This version of the popular story is taken from an excellent abridgment done for children by James Baldwin in the early 20th Century. Customer Reviews For "Pilgrim's Progress (Abridged 3cds)"
Our church has found this edition (amongst many others that we considered) to be the most helpful edition of the timeless classic. We were looking for one that is easily readable in modern English, and yet faithful to the original story. As a bonus, the illustrations are well done. We were also keen on a hardback, so as to be make an enduring gift for people. We use it as a gift for many of our new church members. 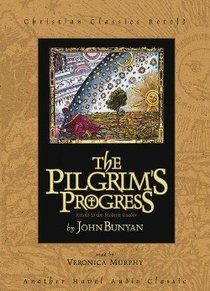 The Pilgrim's Progress is a fantastic classic story, following the journey of 'Christian' as he travels to the Celestial City. It is amazing how often a story written so long ago can still resonate in today's culture. The original story is only made better by this edition from Crossway. Three main things enhance it: 1) the editing is particularly good, both staying true to the words of Bunyan whilst updating the language to read more easily, replacing words that we don't use anymore with more common ones, 2) the notes at the back of the book are great for further explanation to some of the images used by Bunyan and what they represent, 3) the illustrations provided for this edition bring the story to life and add character in depicting the world that Bunyan may have envisioned. I highly recommend both the original story and this particular edition.